The West End of London (commonly referred to as the West End) refers to a distinct region of Central London, west of the City of London and north of the River Thames, in which many of the city's major tourist attractions, shops, businesses, government buildings and entertainment venues, including West End theatres, are concentrated. While the City of London, or the Square Mile, is the main business and financial district in London, the West End is the main commercial and entertainment centre of the city. It is the largest central business district in the United Kingdom, comparable to Midtown Manhattan in New York City, Causeway Bay in Hong Kong, Shibuya in Tokyo, or the 8th arrondissement in Paris. It is one of the most expensive locations in the world in which to rent office space. Medieval London comprised two adjacent cities – the City of London (cathedral: St. Paul's) to the east, and the City of Westminster (cathedral: Westminster Abbey) to the west. 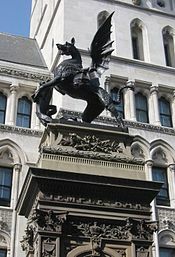 Over time they came to form the centre of modern London, although each kept its own distinct character and its separate legal identity (for example, the City of London has its own police force and is a distinct county). The City of London became a centre for the banking, financial, legal and professional sectors, while Westminster became associated with the leisure, shopping, commerce, and entertainment sectors, the government, and home to universities and embassies. The modern West End is closely associated with this area of central London. Lying to the west of the historic Roman and medieval City of London, the West End was long favoured by the rich elite as a place of residence because it was usually upwind of the smoke drifting from the crowded City. It was close to the royal seat of power at the Palace of Westminster (now home to Parliament), and is largely contained within the City of Westminster (one of the 32 London boroughs). Developed in the 17th, 18th and 19th centuries, it was built as a series of palaces, expensive town houses, fashionable shops and places of entertainment. The areas closest to the City around Holborn, Seven Dials, and Covent Garden contained poorer communities that were cleared and redeveloped in the 19th century. As the West End is a term used colloquially by Londoners and is not an official geographical or municipal definition, its exact constituent parts are up for debate. Westminster City Council's 2005 report Vision for the West End included the following areas in its definition: Covent Garden, Soho, Chinatown, Leicester Square, the shopping streets of Oxford Street, Regent Street and Bond Street, the area encompassing Trafalgar Square, the Strand and Aldwych, and the district known as Theatreland. The Edgware Road to the north-west and the Victoria Embankment to the south-east were also covered by the document but were treated as "adjacent areas" to the West End. According to Ed Glinert's West End Chronicles (2006) the districts falling within the West End are Mayfair, Soho, Covent Garden, Fitzrovia and Marylebone. By this definition, the West End borders Temple, Holborn and Bloomsbury to the east, Regent's Park to the north, Paddington, Hyde Park and Knightsbridge to the west, and Victoria and Westminster to the south. Other definitions include Bloomsbury within the West End. One of the local government wards within the City of Westminster is called "West End". This covers a similar area that defined by Glinert: Mayfair, Soho, and parts of Fitzrovia and Marylebone. The population of this ward at the 2011 Census was 10,575. The annual New Year's Day Parade takes place on the streets of the West End. The West End is laid out with many notable public squares and circuses, the latter being the original name for roundabouts in London. ^ Atkins, Peter J. "How the West End was won: the struggle to remove street barriers in Victorian London." Journal of Historical Geography 19.3 (1993): 265. ^ How the West End was won: the struggle to remove street barriers in Victorian London. Atkins, P J. Journal of Historical Geography; London Vol. 19, Iss. 3, (Jul 1, 1993): 265. ^ "City of Westminstee ward population 2011". Neighbourhood Statistics. Office for National Statistics. Retrieved 15 October 2016. Wikimedia Commons has media related to West End of London.